The true origins of Well Dressing are lost in the mists of time. According to many sources, it developed from a pagan custom of making sacrifice to the gods of wells and springs to ensure a continued supply of fresh water. Like many folk traditions, it was later adopted by the Christian Church as a way of giving thanks to God for His gift to us of water. Tradition has it that it took on a special significance in 17th century Derbyshire as various villages, notably Tissington, gave thanks for their deliverance from the Plague which had decimated nearby Eyam. In truth they had been spared by the altruism of the inhabitants of Eyam, who quarantined themselves while the disease, accidentally introduced in a package of clothing from London, ran its deadly course. Of course, this does not mean that the other villages has any less cause to express their grateful thanks. In the early days, the dressing of wells would have taken the form of simple arrangements of flowers and other natural materials. In this form it takes place today in many parts of the world. 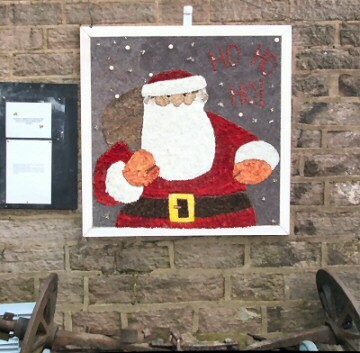 The unique Derbyshire tradition of elaborate pictures made for the most part of individual flower petals pressed onto clay covered boards seems to date from Victorian times, when there were many movements afoot to revive and enhance old folk traditions. The earliest recorded examples are in Tissington, but the tradition quickly spread to other villages. Sometimes, as in Youlgrave, the Dressings appeared at the village taps (pumps or fountains) to celebrate the arrival of piped water; hence the reason why they are sometimes known as Tap Dressings. One example of Tap Dressing was in Endon in the mid-19th century, possibly as early as 1845. 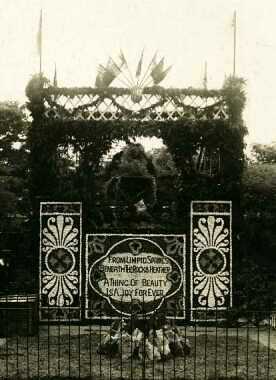 Endon is in Staffordshire, thus disproving the commonly held belief that Well Dressing beyond the boundaries of Derbyshire is a recent phenomenon. Like Tissington and Youlgrave, Endon continues the Well Dressing tradition to the present day. 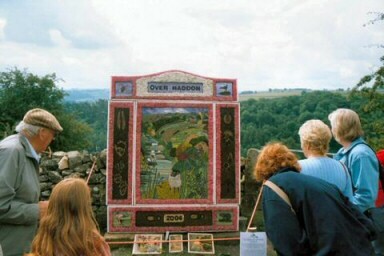 Another commonly held misconception is that Tissington is always the first Well Dressing of the year. 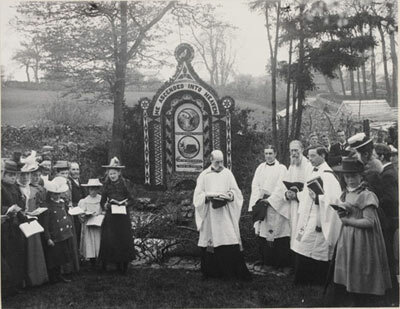 This used to be true; Tissington has kept to the tradition of holding its Well Dressing Festival on Ascension Day, while the next group of dressings typically occurred at Whitsun. With the introduction of May holidays on fixed dates, however, a number of venues now hold their events in the early part of May. Because Ascension Day is a moveable feast, these can occur before of after the date of Tissington. Quite a number of town and villages have a long standing tradition of Well Dressing going back to the late 19th or early 20th centuries. Others have come and gone over the years, but the last few decades of the 20th century saw a great revival of the craft, with many villages in Derbyshire taking up the tradition. Villages in other counties did so too, often as a result of a former Derbyshire resident moving there. A kind of peak was reached with the Millennium Year when everyone seemed to pull out all the stops to make a great celebration. After that a slight malaise seemed to set in and a number of established venues disappeared from the calendar. Writing nearly a decade later, I am happy to be able to record another revival under way; although we may still be losing a few old established and much loved venues, many more new events are seeing the light of day each year. It is my hope that the information resource that this website provides will stimulate many more to try the craft, and to let others know about their efforts. Also that many, many more will feel the desire to visit the delightful results of this tradition in our beautiful villages, to look, to encourage, and to drop a few coins in the collecting boxes for charity and to ensure the continuance of the tradition. Although Well Dressing is generally a summertime activity, very occasionally a dressing is made in winter, using natural materials that are available at the time of year. The first record I have of such a dressing is in West Hallam in the 1990s, a very impressive nativity scene forming part of the village's Christmas decorations. Spire Infant School in Chesterfield have produced small dressings on a couple of occasions in December. Buxworth have made a winter dressing each year since 2006, and hopefully this will be an ongoing tradition. It is not my intention to provide an instructional here; if you are going make your own Well Dressing you really need hands-on instruction from experienced Dressers. It is not hard; but you will best learn the techniques from someone who has done it before. 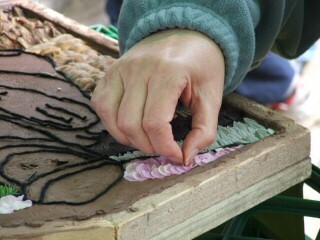 Many venues welcome visitors to see the Well Dressings being made. Most of these will let you try your hand. See the Calendar page or individual Venue pages for more details. The first step to actually making the Well Dressing is to get a board. It needs to be strong to take the weight of clay, and it needs to be a good quality timber or board that can stand soaking in water. The boards are soaked for up to a week before applying the clay, often by leaving them in the village stream or pond. The soaking is necessary because if wet clay is applied to a dry board, the boards will swell and the clay will crack. Wet boards also help to keep the clay moist, which in turn helps to keep the pictures fresh. Boards can be expensive, but they can be reused year after year. If you are just starting out, you may be able to get a second hand board from an established venue that are replacing theirs. The clay: good clay can be hard to find; pottery clay is ideal but can be expensive. If you live near a clay pit, you may be able to get a barrow load or so cheaply, or a pottery may have some stock that is not quite good enough to be used for pots. I have heard of garden clay being used, but this is going to need a lot of work to make it smooth and free of rubbish such as stones and twigs. The most important thing about the clay is that it is very smooth, and this is achieved by puddling. Traditionally, clay is puddled by putting it in an old tin bath or tank and working it with hands or feet (children love helping with this bit!) until it is smooth and the right consistency. What makes just the right consistency is one of those matters of experience. Too wet and the clay will fall off the boards. Too dry and it will not properly hold the materials for the picture. While all this is going on, you need to design your picture. Study other dressings to see what makes a good design, choose your subject and draw it out. Keep it simple for your first attempt and always try to avoid detail that is too fine. Choose your colours to suit the materials you have available; go for nice bright colours and good contrast, especially for things like lettering. You might think, for example, that red berries would show up well against a background of green leaves but more often than not they do not. 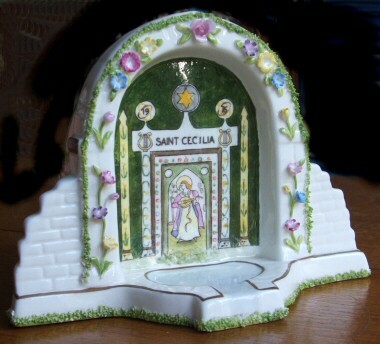 Photographs of past dressings can be a good clue for matters such as these; consult the welldressing.com Photo Albums. Materials can be gathered from local gardens with the cooperation of the owners; if you need to purchase, your local supermarket may be a reasonably priced source of fresh flowers. Your materials should ideally be all natural, though this ideal is not always followed in practice. The final design for the picture needs to be full size, outline only. The computer can help you here by enlarging small pictures. It can also help you with some of the tricky detail, such as outlining good clear lettering. The board needs a wooden surround built up to the thickness of the clay. This can be anything from about 2 to 5 cm. In general, the more clay the better, but for a large board the weight (and cost) become important, and a thinner layer may be used. A 90 cm by 60 cm board with 3 cm of clay on will need at least four strong people to lift it safely. Very large dressings are usually made up of more than one board; sometimes a farmer's loading crane or similar is pressed into service to assist with putting up the larger structures. To help the clay to adhere, the board may have drilled holes or may be studded with nails or pegs. The clay is applied by throwing it at the board in handfuls, then carefully smoothing it out level with the wooden surround. Lay the finished outline picture over the clay. Using a toothpick or similar, prick through the entire outline onto the clay, taking care that the picture does not move while you are doing this. Remove the paper. You should now have the outline picture imprinted on the clay. Organise the work on the picture so that you start with non-perishable materials such as bark and twigs, progress through leaves and the like, and finish off with the delicate materials such as flower petals. This way, work can be spread over as long as a week, with petals being applied on the last day before the dressing goes on display. Mark in the pricked outline first. One favourite material for this is small alder cones; but any other small, dark pieces can be used, such as seeds, tree bark, or even coffee beans. Then fill in the areas between the outlines. Use whole, undamaged petals or leaves, separate them carefully from the plant, and press the stem end lightly into the clay using a tool such as a toothpick. Again here, only experience will tell you how much pressure to use to ensure the material will stick without causing damage. Petals in particular are very delicate and will fade quickly if cut or torn. Start at the bottom of the picture and in each area make a horizontal row of petals or leaves, pointing downwards from where the stem is inserted in the clay. Make the next row overlapping the first, like tiles on a roof, and continue in this manner until the area is filled. If your boards are laid flat while you are working on them, it is customary to have the top of the board towards you so that you are not leaning over finished work. Colours of individual petals vary slightly, even on the same plant. This is particularly true of hyacinth, which is very popular for representing sky. You will get a better overall effect if you try to grade the colours so that they can be arranged in bands and patches rather than just at random. This is of course something of a nicety and may be among the least of your worries if this is your frist attempt. Hands and faces: flesh tones are notoriously difficult to catch; the best advice for beginners might be to avoid them altogether! However, there are materials that can successfully be used, for example pieces of eggshell. Some venues will leave hands and faces as bare clay. This is not laziness, it is in fact symbolic of Adam having been made out of clay by God. Bare clay can also represent barren soil, where this is appropriate for the picture. Remember, though, that if you do leave any areas of bare clay, you risk them drying out and cracking. You are now ready to transport the dressing, with extreme care, to the site where it will be displayed. Ideally you want a well lit but north facing location, perhaps against a wall. This is not always possible! However, try to avoid direct sunlight as much as possible. If the dressing is located under trees ensure that water from the trees will not drip onto the dressing. To keep the dressing pristine, expect to do some small repairs each day that it is on display; have a small stock of spare material handy to do this. Keep the dressing moist. There are two schools of thought regarding whether spraying a light mist of water from the front is beneficial; some venues do it routinely, others insist that it will actually damage the dressing. Whether or not you spray, but more importantly if you do not, it is advisable to keep the whole dressing wet from the back. This can require as much as several buckets of water each day. Evaporation can be reduced by covering the wetted back of the dressing with sacking (which can itself be wet) or polythene. Hopefully many people will come to see the results of all your hard work - you did remember to tell welldressing.com about it well in advance, didn't you?